The stunning Alpamayo is one of the world’s most beautiful peaks, climbing Alpamayo is a challenging but very rewarding adventure. Maybe you have climbed Island peak and want to experience the mighty Alpamayo. We will acclimatize and prepare by climbing Pisco at 5,750m (18,865ft), known as one of the easiest mountains in the Cordillera Blanca Mountain Range in Peru. Pisco is generally used for acclimatization for one of the 6,000m (19,685ft) peaks in the area. Other than the altitude, the normal route up Pisco is straight forward. Our trip heads through Huaraz to the top of Pisco and back, which will take 4 or 5 days. Pisco is a spectacular pyramidal peak set right in the heart of the cordillera Blanca and the perfect lead-up to climbing Alpamayo. E-mail or call us for more information. With our acclimatization complete, we will head for one of the most beautiful mountains in the world, Alpamayo 5,947m/ 19,511ft. One look at the southwest face of Alpamayo and any climber in the world would be interested in attempting to climb this remarkable peak. 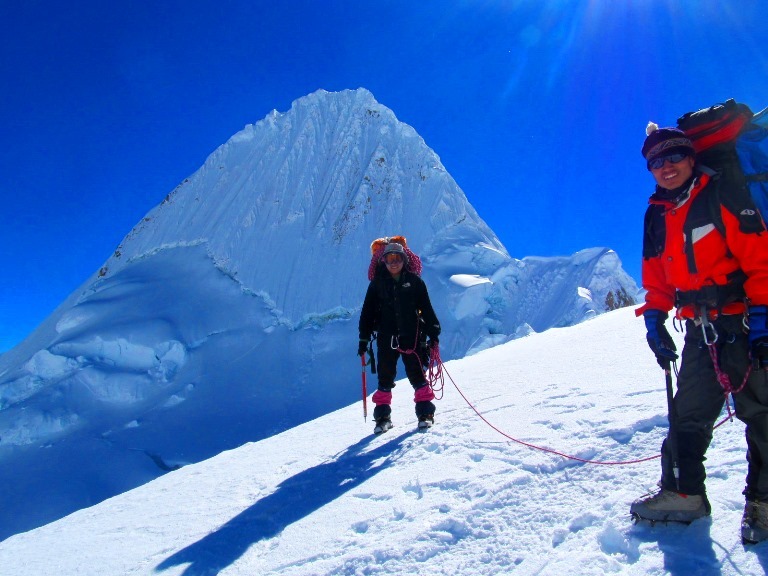 Alpamayo climbing is challenging and should only be attempted with prior altitude and mountaineering experience. fiercely fluted faces combined with knife edge ridges form one of the most iconic peaks in the world and often can be the highlight of a climbers career. Alpamayo’s Southwest Face offers 366m/ 1,200 ft of challenging alpine ice, much of it at an angle of 60 degrees or steeper. Arrive in Lima. You will be met at the airport and transferred to your Hotel. You can relax or head out to explore Lima at your own leisure. We will drive by bus from Lima to Huaraz (3,090m/10,138ft) in the north. This is an 8 hour trip through the Pervian Hills and upon arrival a rest will be needed for tomorrows trek. Today we will do an acclimatization day trek. We will make our way up to Laguna Churup at 4,450m (14,600ft). Huaraz to Llanganuco. We will move up to Pisco Base Camp which is at 4,300m (14,108ft). We head out past the beautiful Llanganuco Lakes and on to the trail head where we load our donkeys and ascend to the Pisco Base Camp. 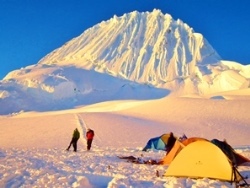 Today we will head from our Base Camp Pisco to the Moraine Camp at 4,765m (15,633ft). This climb crosses a challenging rock glacier before climbing steeply into camp in a small sandy basin just below the glacier. Summit Day! Moraine Camp to the summit of Pisco (5,750m/18,865ft) and back to Base Camp at 4,300m (14,108ft). We will wake up at 3am and after a light breakfast depart for the summit. Arrive at the summit around 7 or 8am and discover why everyone talks about this stunning view! Return to camp and continue on back down to the Base Camp. Today we will head from Base Camp back to Huaraz to rest up and recover for Alpamayo. Free day in Huaraz to relax and recover from the previous few days climbing. In the afternoon you will get all your gear ready for Alpamayo Climbing. From Huaraz we pass through Cashapampa on the way to Llamacorral Camp at 3,750m (12,303ft). Drive to the trailhead in the village of Cashapampa (2,750m/9,022ft). This 3 hour drive takes us through beautiful farming communities as we head between the spines of the Cordillera Negra and the Cordillera Blanca. After organizing our burros, we trek with your day pack to Llama Corral (3,750m/12,303ft), where we will camp for the night. Llamacorral Camp to Base Camp Alpamayo at (4,200m/13,780ft). Today will be a fairly short day, about 2 or 3 hours carrying only our day packs. Our base camp will be set up in a valley at the base of Alpamayo on the opposite side of the route. Our base camp is a stunning place , with greenery, running water and out houses. Base Camp to our Moraine Camp at (4,600m/15,092ft). From base camp, the route takes a moraine ridge and crosses rock slabs across the edge of the glacier to reach an area of tent platforms, approximately a 3 hour trek. This camping area is very limited and we may opt to climb all the way to Col camp in one day. Moraine Camp to Camp 1 on Alpamayo at (5,300m/17,388ft). The route above moraine camp continues over ice and moraine before a (300m/ 984ft) snow couloir leads to the Col between Alpamayo and nearby Quitaraju (6,040m/19,816ft). This section can sometimes be the most technical and difficult part of the route. After getting to the col, there is a short descent to reach our high camp. Camp 1 to the summit of Alpamayo (5,947m/19,511ft) and back to Base Camp at (4,200m/13,780ft). 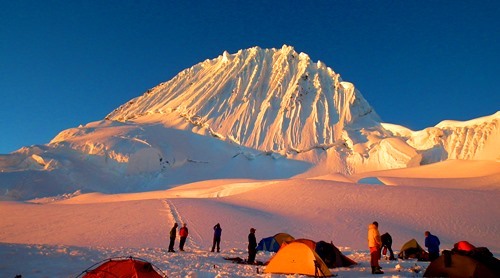 On Alpamayo Summit Day, we will depart from camp at 1 or 2 am and head to the steep summit wall, which offers 360m/1,181ft of fun technical climbing to the summit. This is strenuous but rewarding and your view off the summit is nothing less than spectacular. Base Camp to Llamacorral Camp. 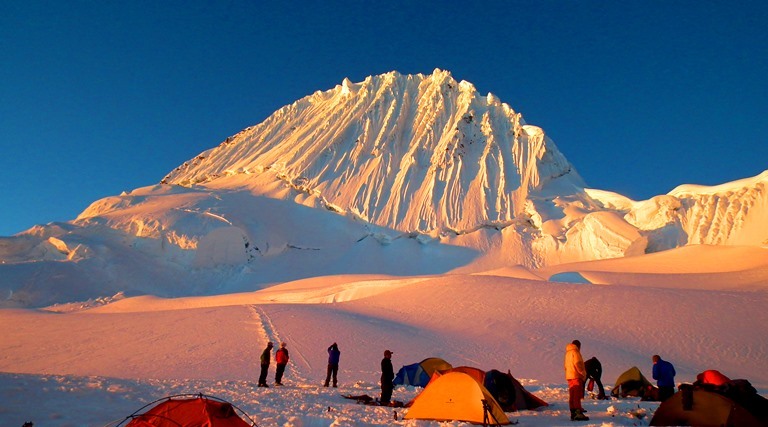 We will trek out to Llamacorral Camp approximately 3 hours from Base Camp of Alpamayo and will camp in Llamacorral. Llamacorral trek to Cashapampa and return to Huaraz. Time to relax after the climb and reflect on the successful summit and enjoyable journey. Today we will journey back to Lima and arrive in the afternoon and transfer to hotel or to your onward journey. Does this information excite you to take the next step towards achieving your goals in the mountains? If so, get in touch today. We pride ourselves on making sure that our clients have every opportunity to succeed on the mountains, including professional training advice, gear lists and video links on how to pack your bag, and much more. We are always available to answer any questions you may have by email, phone or skype, so contact us today!